In this video, we will be learning how to solve compound inequalities. Let’s go over solving compound inequalities. 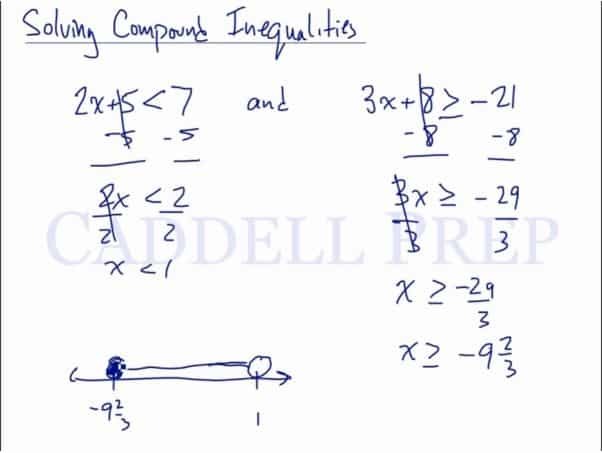 Compound inequality means we have two inequalities that are associated. Here we have two constraints for the value of . Let’s solve the first one first. Let’s subtract from both sides. But is not just less than . It should also satisfy the other inequality. So let’s solve this by first subtracting on both sides. Now let’s solve for by dividing both sides by . If we graph this, draw a number line with the lowest number at and the highest number is . Since is less than , let’s draw an open circle on number . We also know that , so let’s draw a solid circle on then draw a line between the two points. Our next example is written as one long inequality. So we’ll solve this as a whole at once. Let’s start off with subtracting from all sides of the inequality. Now, let’s solve for by dividing the inequality by . Let’s graph the solution by drawing a number line with the lowest number as and the highest number is because is everything between the two. Let’s draw a solid circle at number to represent the equal sign and an open circle at . Then draw a line in between. Now, it’s not always the same number. Let’s solve it the same way as above. This time our number line starts at and ends with . The circle on is solid because it has an equal sign and an open circle at . Let’s move on to another type of compound inequality. We have to solve this individually. Let’s start with the one on the left. Now let’s solve the other one. Let’s solve for by dividing both sides by . Let’s draw line number with as the lowest number and the highest number is . We draw an open circle at and draw a line going to the left. Then draw a solid circle at and a line going to the right. Notice that the lines we drew are opposite of each other. Because the inequality we have is an “or”. So the numbers between the two are not the answer. Our answer satisfies one or the other, not both.